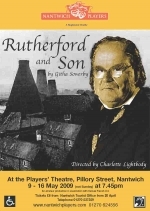 John Rutherford's obsession with the traditions of his familyâ€™s glass-manufacturing business brings him into conflict with his family. Simon Porter is Rutherford and his family are played by Katy Hooper, Ken Riley and Nigel Vernon. Strong performances from other Players, a stunning set and vivid portrayal of the struggle for progress at the turn of the 19th century make this another 'must-see' play from the Theatre on your doorstep.